Consumers now prefer to shop online instead of visiting brick-and-mortar stores. In fact, it is predicted that the online retail sales will increase to $370 in 2017. Based on a survey conducted by “The Intelligence Group (TIG)”, it was observed that nearly 72% of Millennials search for their favorite products and shop for them online prior to going to any store/mall. Over 80% of the online surfers have already made purchases over the web, and more than 50% of consumers have purchased using the Internet more than once. Around 36% of the online population spend over 30 minutes and 16% spend more than 16 minutes, in comparison shopping before making the final decision on buying their choice of products and so on. In most of the companies 90% of their decisions relating to purchasing begins with an online search. All of the above mentioned statistics are the evident to the fact that it has become more important than ever for retailers and businesses to have an online presence. But, one thing you should keep in your mind is: that merely creating an online identity for your business won’t help you drive more traffic and increase your e-shop conversion rate. It’s very important that your e-commerce website should not come up with any downtime issues. Simply put, optimal performance of your e-shop can play a huge difference in the success and failure of your site. And, using website monitoring services can help you in analyzing the performance of your site, which eventually helps in increasing online profits. Through this post, I’ll discuss about the importance of website monitoring services. Additionally, you’ll come to know about the benefits you get by website monitoring and the techniques to use monitoring services. Why You Need to Opt For Website Monitoring Services? Online studies demonstrate that over 90 percent of consumers prefer to shop from online stores that delivers high performance and offers a user-friendly interface. 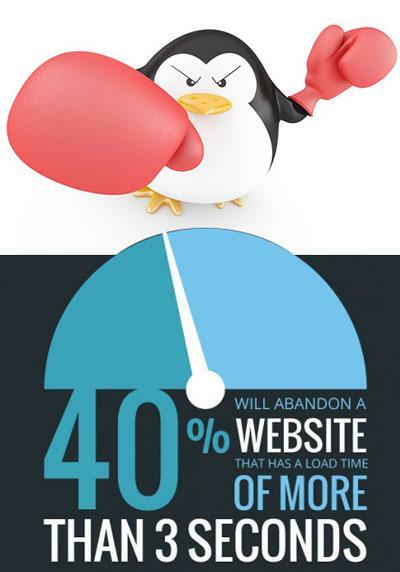 But, if a website page takes more than 3 seconds to load, 40 percent of users will abandon that site. And 80 percent of those users won’t revisit the site because of its poor performance. As a matter of fact, slow loading sites will make a bad first impression among 50 percent of the users. This clearly suggests that poor website performance can prove damaging to your online reputation, and may make you lose a lot of your customers. But, in the case your e-shop is performing well, you won’t have to worry about losing your customers. And, you can check out if your site is performing smoothly or not using website monitoring services. You can get immediate email alerts pertaining to website monitoring solutions. Prevent You From Losing Sales: The success and failure of a business depends on the sales it makes. If you’re facing issues in increasing your website sales, then you won’t notice them unless you monitor your site. For instance, frequent downtime issues can result in lost leads. However, for e-stores and e-commerce sites, maintaining good uptime is crucial to increase sales. The major benefit of having your site monitored is that you’ll get alerts if downtime issues are found; this will help you take necessary action to tackle with such issues. Helps in Obtaining Better Search Engine Rankings: Your search engine ranking can be affected by downtime issues. Moreover, Google penalizes sites that run slow or contains errors. Low search engine ranks will push your website at the bottom of search results, which will make it difficult for your users to find your site. However, monitoring services can help you find the problems that are keeping your site obtain better ranks on the search engines. Avoiding such problems from happening at the first place will help boost your search engine ranking. Help You in Making Marketing Decisions: You can enjoy more benefits than great website uptime by choosing the right monitoring service. It can help you in making important marketing decisions as well, as it provides statistics, analytics, and many other facts. You can use the facts to improve your website marketing efforts. That’s because, analytics can help you know from where your traffic is coming and when they’re expected to leave your site. Additionally, you can even learn about the browsing, as well as, spending habits of your customers and provide valuable insight about your customers. Knowing what your customers want will help you deliver them a positive experience. Help Detect Hackers: Every now and then, we come to know about hacker attacks targeting all kinds of sites – whether big or small. Protecting your site from hacking attempts can be difficult, especially when you don’t even know about your site being hacked. Fortunately, there are free website monitoring services out there that can help in detecting any hacking attempt if made on your website. You’ll get instant alerts if your site has been attacked by a hacker. As discussed above, you can find many website monitoring services to improve the performance of your Magento online store, which help increase your site’s online revenue. 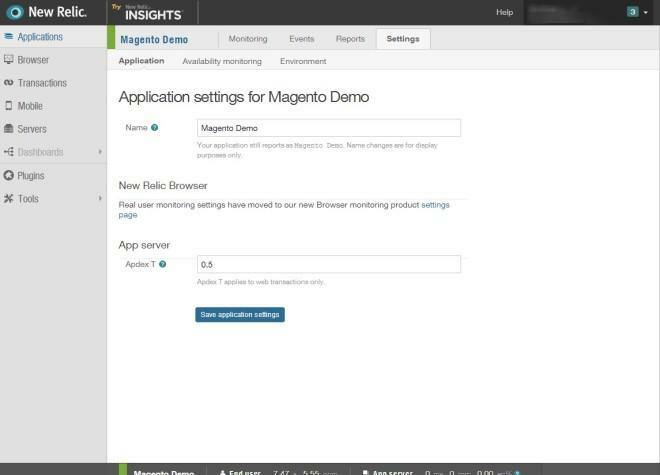 However, we’ll talk about the New Relic website monitoring service and how it can be used to monitor your Magento e-store. I won’t be discussing about the process of installing New Relic, as you can know about its installation process, as covered in the documentation. 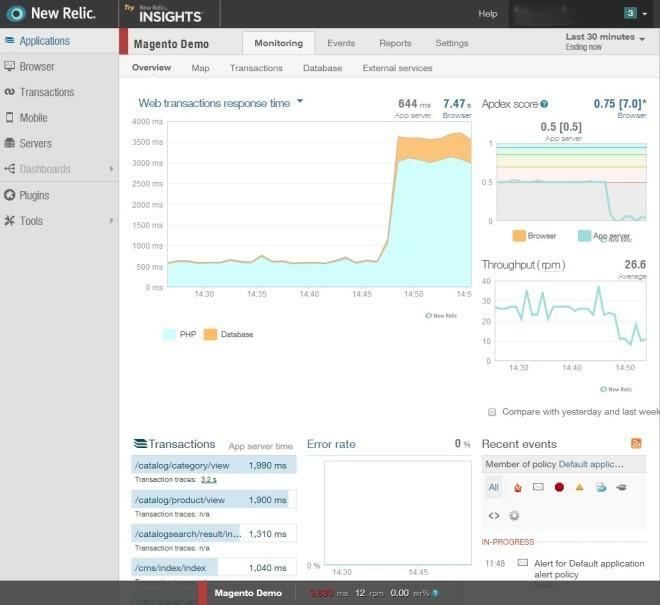 So, once you have installed New Relic on your Magento store, let us see how it helps in monitoring the store. Let’s say, you asked some developer to create a module for adding a custom attribute “featured” on the latest products. But, after getting that feature implemented, you saw that your Magento store is taking longer to load. This is a common scenario that most of the Magento users often stumble upon. But, New Relic can help you deal with such an issue. First of all, you’ll have to install the New Relic module called as Yireo. This module will help you provide a proper account of what all is happening on your Magento store. After getting this module installed, navigate to System → Configuration →Advanced → New Relic. And then, simply enter the details like your Application Name (e.g. name of your store), New Relic Browser (previously known as Real User Monitoring), etc. After making the desired selections save all the changes you’ve made. The above screenshot help analyze web transactions response time, transaction error rate and so on. But, what if you want to specifically look at a certain value of a transaction? In order to do so, you’ll need to configure application settings of “New Relic” application. Satisfied: It tells about the user satisfaction rate when the response time is either less than or equal to time threshold “T”. Tolerating: It means that the response time is greater compared to T, and at the same time is either less than or equal to 4T. Frustrated: This is the state when users become frustrated and may abandon your site when the response time is more than 4T. 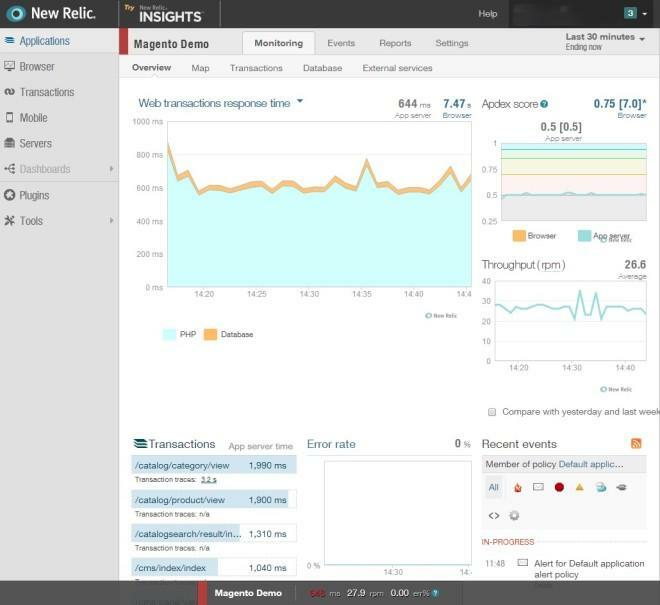 The New Relic module will record the transactions that takes over 2 seconds (i.e. the “frustrating” threshold). And so, you need to assign your ‘Apdex T’ a value of 0.5. After getting the module installed on your server, you will be able to debug your Magento store performance issues. You can see a sudden increase in the “Web transactions response time” than before. In a nutshell, New Relic will help you debug the transaction that takes up more time to process. Website monitoring services can help you know about the areas of your site or issues – that might be preventing the site from performing well. But, once you come to know about the factors behind the poor performance of your site, you can fix them to optimize your website performance. This will eventually help in generating more profits from your site. Reading this post will provide you with useful insight on the significance of using website monitoring services, its benefits and how you can use one to gain more profits from your online venture.